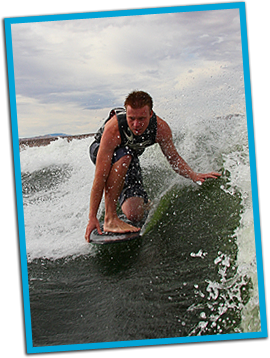 Utah, Arizona, Idaho Wakeboard lessons, wakeboard sesssions, wakeboarding schools & wakeboard camps for the water sports & boating enthusiasts. There is nothing like catching air for the first time or landing a difficult trick or jumping the whole wake for the first time. Centurion offers the best wake enhancement equipment in the industry we feature the switch blade and perfect pass on our professional wakeboarding boats. Free instruction included in all Watersports charters, join us on the lake of your choice for Wakeboarding, water skiing or wake surfing sessions. Don’t have a boat? Don’t need one. There is a package that will fit your budget. Take advantage of our water sports packages for the summer. TK WATERSPORTS will help you get up and catch some air for the first time or help you get to the next level. Nothing moves you forward like time on the water. I have seem some gifted riders get up on there first try but those are few and far between. Its quite possible it may take many tries but once you get up a few times you get the hang of it. Your lift comes from a combination of rope speed (accumulated as a result of building up rope tension) and upward momentum from the wake. Think of a wake jump not as a "jump" but more of a ramping action. You are using the wake as a jump. The first concept we will need introduce is the progressive edge. This type of edge basically means that your edge starts out mellow and gets harder and harder as you approach the wake. You should be cutting your hardest as you go over the wake. If you have a good progressive edge you will build line tension (not slack)! For your first few jumps, start just ten or fifteen feet outside the wake on your toe side. Cut towards the wake progressively putting more weight on your heels. When you get there, stand up tall. Don't lift your knees up or try to "jump." Just extend your knees and stand tall. If you're not getting the desired results, you need to wait longer. Many people stand up too soon or stop cutting before they reach the wake. This kills all of the momentum you've built up and leads to marginal jumps. Cut until the top of the wake, then stand tall. It will take a bit of practice to get your wake jump looking good. It's well worth it, though. 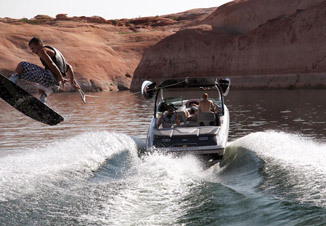 Once you are consistently landing small jumps, you can start trying to clear the wake).